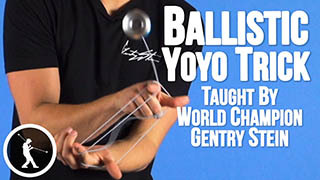 Learn the Razor Sharp Yoyo Trick from Gentry Stein. Razor Sharp Yoyo TrickThis trick is called Razor Sharp, here is what it looks like. 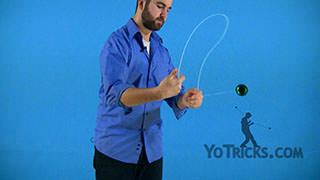 To start this trick, you want to throw a Trapeze, then you are going to do two repetitions of a Trapeze Follow, YoTricks already has a tutorial up of this if you want to check that out. Then on the second repetition of the Trapeze Follow, you are going to whip your yoyo hand under your opposite hand enough so that the string whips all the way around and lands on the yoyo. When you are doing this part of the trick, you want to keep two things in mind. 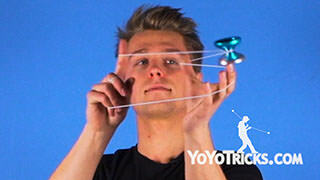 First, make sure you are pinching the string right above the yoyo. You don’t want to leave too much space here or else there is not going to be enough string to whip all the way around. Also, you want to make sure at the bottom of the whip you flick your wrist so that the string has enough momentum to land on the yoyo. When doing both of these parts of the trick together, you don’t want to pause in-between, and you want to make sure that they tie together seamlessly. After landing the whip you want your opposite index finger to be pointing towards you. 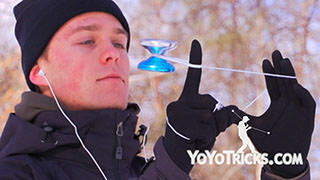 Then you bring your yoyo hand under the yoyo which leaves you in a Trapeze on the opposite side of your body. This will set you up for another Trapeze Follow, but this time only do one repetition and land the string on the top of your shoulder. Then you want to move the string off your shoulder toward the front of the yoyo and do a full circular swing behind the yoyo into a Slap Bridge Bind. 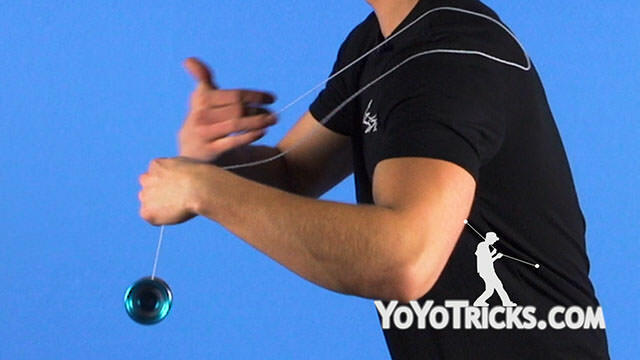 When practicing just the bind you want to swing the string behind the yoyo and use your forearm to slap the string into the gap of the yoyo. To make the trick a little more interesting, exaggerate the movement off your shoulder and don’t forget to catch with style.